C-Therm regularly offers FREE online seminars - or "webinars" - to provide information on new applications and offer participants an opportunity to learn how C-Therm's clients are using the innovative sensor technology. The webinar is a combination of a live powerpoint show presented over the internet, and a conference call with participants. Please browse our listing of live upcoming webinars below or check our library of past archived webinar recordings . 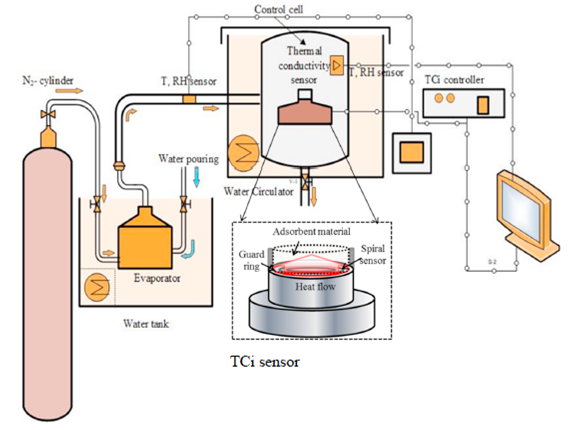 How Does Relative Humidity Affect the Thermal Conductivity of Porous Physisorbent Materials? Advance registration is required for any listed upcoming webinar. Please click on the Register button below to participate in the upcoming webinar and receive instructions on how to join us online for the event. Please note that if the time is not convenient for your group - C-Therm does offer custom private webinars. Please inquire for further details. Feel free to contact us at info@ctherm.com with any questions. Adsorbent materials are solids used to capture atoms or molecules of a gas, liquid, or dissolved solid onto the surface of a material. Absorbents, by contrast, capture fluids by dissolving into a liquid or permeating into a solid. Adsorption is therefore a surface phenomenon while absorption is inherently a solution phenomenon. Adsorbants can be classified as physisorbants (where adsorbed material is held to the surface of the sorbent via weak, physical interactions like van der Waals forces and hydrogen bonding) and chemisorbants (wherein the adsorbed material is captured through the formation of a chemical – typically covalent but occasionally ionic – bond). Adsorbents are widely used in carbon capture and storage, medical devices such as portable oxygen concentrators, in effluent treatment from industrial plants, and in water treatment for drinking, among other applications. One emerging application of adsorbents is in heat pump and cooling systems. In this application, the thermal conductivity of the sorbent is a key performance metric, as it limits the cycling efficiency and speed of heat transfer into and out of the system. However, for sorbent materials, many factors affect the effective thermal conductivity – including degree of saturation of the sorbent. This webinar highlights work from Japan and Pakistan using C-Therm’s patented Modified Transient Plane Source method – available both on the C-Therm TCi Thermal Conductivity Analyzer and on the C-Therm TRIDENT Thermal conductivity platform – to study the effect of relative humidity on sorbent effective thermal conductivity.